Let’s get to know how to create quizzes in ActivePresenter. 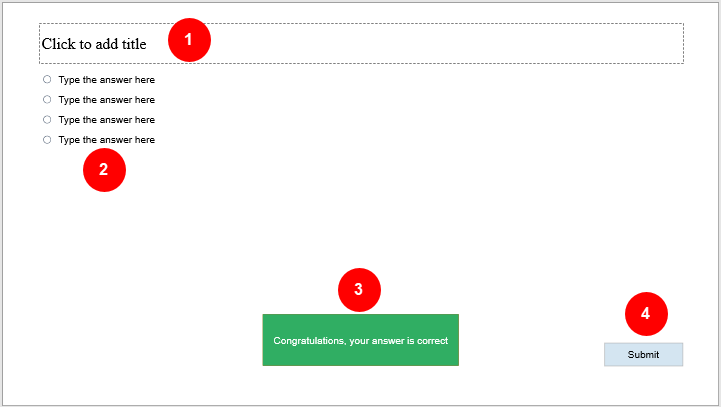 Creating quizzes in ActivePresenter is easy. Open the Interactions tab and select the quiz that you want to create. After that, ActivePresenter will insert a new slide that contains the question. A typical question has four parts. Two main parts are the group of answers and the title of the question slide. Two others are feedback messages and buttons. You can type the title of the question in this section. This is the answer of the question. The number of answers depends on the types of questions you are using. For example, a True/False question has two answers while a multiple choice has four answers by default. You can add more or delete answers of questions (except True/False, Essay, and Fill in Blank). Step 2: Click the green circle button that appears. On the other hand, to delete an answer, just select it and press the DELETE key. A question has many types of feedback message (e.g. Correct, Incorrect, Timeout, Complete). In addition, different types of question may have different types of feedback message. Each question has default feedback messages and you can insert or delete them. However, you should open Slide Master view before adding or removing them to keep the project consistency. Step 1: Open Slide Master view. To view Slide Master, open the View tab and click Slide Master . This saves you much time especially when your projects have many slides. You just need to insert messages into a slide master, then they will be automatically inserted into other corresponding slides of that slide master. If you want to know more about slide masters, see Using slide masters. Step 2: Select the feedback messages on the Canvas. Initially, they are placed coincidently and you can move each of them to other positions if you want. Step 3: Open the Interactions tab and click the Message button. Then, select the feedback message that you want to insert. Alternatively, you can right-click the feedback message, click Insert and select a message from the pop-up menu. On the other hand, to delete a feedback message, just select it and press the DELETE key. Step 4: Close Slide Master view. Finally, close the Master view to apply the changes you’ve made. To do that, in the Slide Master tab, click Close Master View. As you may know, ActivePresenter 6 has four predefined button types which are Back, Clear, Skip, and Submit. ActivePresenter 7 only has Submit. However, you can insert other buttons and customize them, and then set the events – actions for them regarding your purposes. Note: You can insert buttons into any slide normally without opening Slide Master. That way, buttons and their customizations are inserted in that slide only. Open the Interaction tab and click Button. Alternatively, you can open the Home tab, click Interactions and select Button . After that, you can rename and customize the button as you wish. Step 3: Add events – actions to buttons. It’s important to add events – actions to the button to make it interactive so that users can interact with it. To do that, select the button and access the Events – Actions section in the Properties pane. 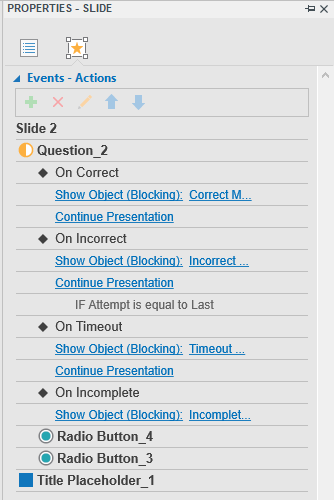 For example, you can insert a button, name it Next and change the events – actions of it so that when learners click on it, the presentation will go forward one, two or any specific number of slides. See Working with events – actions for more details. Events – actions is an important part of creating quizzes. Normally, ActivePresenter has default events – actions for each question. However, you can change it or make it more advanced if you want. In general, you can add events – actions to the question in the same way as adding events – actions to objects. Step 2: In the Properties pane, open the Interactivity tab, then access the Events – Actions section. Step 3: Add/remove more events and actions as you wish. A question can be used for assessing learner performance (using the Graded mode) or collecting viewer feedback (using the Survey mode). Step 2: In the Properties pane, open the Interactivity tab. 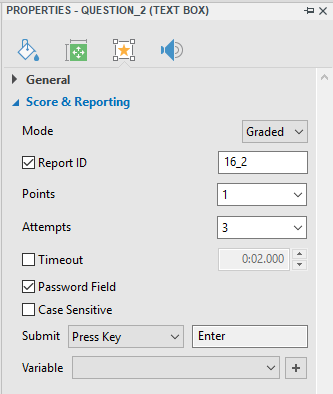 Step 3: Access the Score & Reporting section and select Graded/Survey from the Mode list. Note: While the Graded mode has the score setting, the survey mode doesn’t. This means you cannot set the score that users will gain for each correct answer if you choose the Survey mode. The Score & Reporting section of the question lets you have many settings and controls over how the quiz should be played and reported. The properties of this section may vary differently depending on the question type you are working with. For example, you can set the number of points that learners can gain for each correct answer. You can also set the number of attempts that learners can make before submission, etc. Report ID: This unique reference number is used for reporting the test result. Note that only text that contains alphanumeric characters (A-Z, a-z, 0-9) and underscore (_) is allowed (maximum length is 250 characters). Shuffle Answer: Allow shuffling answer choices of a question. Rating Scale: Specify the number of radio buttons for the question. This is a property of the Rating Scale question only. Points: Allow learners to get a specified point that you set in the Points spin box. Attempts: Set the maximum number of attempts that learners could make. Whenever exceeding the predefined number, users cannot interact with objects anymore. Infinite: There is no limit for the number of attempts that learners can make. Timeout: Enable you to specify the time limit. When you check this check box, if learners don’t respond within the defined time limit, objects will be disabled. Password Field: When you check this check box, the answers (except answers of the essay and sequence question) that contain text boxes will be considered as password fields, which means all the characters that users type in will not be shown. Case Sensitive: If you select this option, the letter case is sensitive. Otherwise, it’s insensitive. Submit: Allow you to specify the short key for the submission. You can also simply let it be Auto, which means the answer will be automatically submitted when finishing. Variable: Define the variable to take place. See Variables for more details. This section let you specify the layout of the answer part of the question. See Group Layout of questions for more details. Note: After inserting and customizing questions, you can save the question as a question template to use in other slides of the project. To do that, right-click the question and select Set as Default from the context menu. Finally, when finishing all the settings for the quiz, it’s time to export it to HTML5. To do that, open the Export tab and lick HTML5. See Export to HTML5 for more details. So, creating quizzes with a powerful eLearning authoring tool like ActivePresenter 7 is not hard to follow, right? Download the app today and start to create your eLearning courses with multiple types of question. Besides, don’t hesitate to contact us if you need help.